The joint plan of Pakistan railway and provincial government is taking place in a timely manner. Quetta mass transit train service project should be started immediately, to provide the public the cheapest and the comfortable source of journey. This project was going to complete in the end of year 2018 but it is still working on road ways (road cuttings). In 2106 the railway authorities reported they will also construct parks and trade centers around the railway track. The government of Baluchistan has given the permission to introduce the modern mass transit train in the provincial capital Quetta, this will be the joint project of the Pakistan railway and the Baluchistan government. Later it became the part of the sea pack project. For the project railway tracks are available but to make it operational train engines and train passenger containers are required. This system will prove to be the model system for the entire country. European mass transit train system has been studied to give final face to the project. Location of Quetta mass train. These trains will run between kuchlak and Spezant railway station. After every 5 km a railway station will be build. After the completion of the project the public will be provided the cheaper facilities of journey, on the other hand it will also help in reducing environmental pollution and the mount of traffic on roads. According to the plan in the first phase of the project the railway track between kuchlak and Spezant will be 5.48 km including 5 to 10 railway stations, 3 head branches and a tunnel this first phase will cost up to 214 million dollars, The first phase will complete in year 2019 and according to an imagination up to 30 to 25 thousand people will travel in this train on daily basis and Cn enjoy the comfortable and modern facility for traveling. In the second phase of the plan the railway tracks will be doubled and more railway stations, business centers and more facilities will be provided. To give the final face to, technical and financial affairs, running the project on fast tracks the provincial government and the china companies will make joint working group between their authorities, and it was decided that the joint working group will remain in touch through video conferencing. 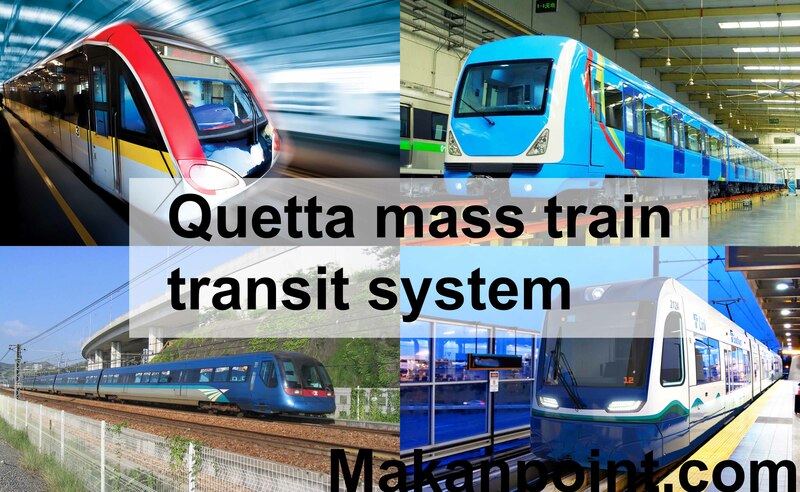 In this regard the citizens of Quetta says that the government should start the mass transit train system immediately so that the public be provided with cheapest facilities to travel. Traffic jam on roads is a big problem in Quetta city. total blockade can be seen in midtown. Its very easy. start the train on a test basis. It will require 1 engine and 2 cabins. first it will take students to Balochistan university and buitems university. Both universities are located near railway tack. an app will show its location and timings. it could be profitable.